According to the latest Info-Currents report Investment Conversations, based on the Large Purchase Study, there are stark differences in the way men and women make investment choices. Women rely on face-to-face conversations, while men are more likely to act based on their past experiences. Considering the combined effect of online and offline word of mouth, nearly six in 10 (56 percent) of women say they make investment product and service choices based on word of mouth, while only 32 percent of men do so. The study validates financial institutions' programs geared towards female customers. It also suggests that companies prepared to answer women's questions and assist with their review process to inform those peer-to-peer conversations will have a competitive advantage. To download a full copy of the Investment Conversations report, please click here. 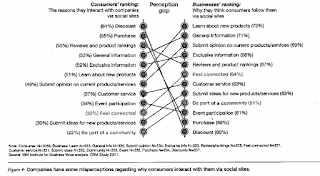 A recent CRM Study (2011) by IBM Institute for Business Value reveals significant gaps between what brands prioritize in their social media communications and what consumers expect when communicating with companies through social media. Guess what? Consumers are not so focused on activities that are deeply engaging and entertaining. (They probably prefer Hollywood for that.) They are looking for discounts. They want to make purchases or they are looking for reviews that will help them solidify their buying decisions. Meanwhile, companies are spending dollars on providing general information and product updates. A significant percentage of companies believe consumers follow them to feel part of a community (64 percent) or to access customer service (63 percent). As the image below shows, these items are not as high on consumers' list. So, have we been wrong about polls and quizzes and 2 minute videos that bring color and interaction to Facebook fan pages? Not necessarily. However, we are missing an opportunity to close a sale if we do not bring product to these activities and give consumers the chance to try products, read reviews and purchase in one click. 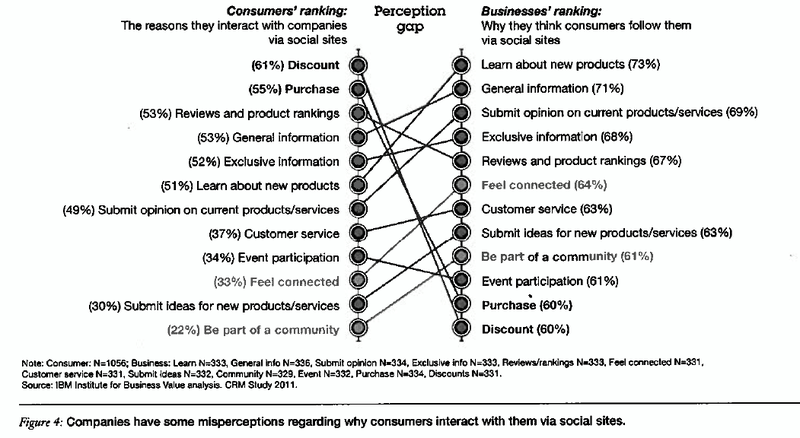 Consumers have their friends and other personal connections on social networks giving them a sense of community. When it comes to b-to-c relations in social media, commerce should be at the center of branded activities. cmp.ly, the company that creates turnkey compliance solutions for blogger engagement and social media activities has just announced a product for financial services. These regulated companies no longer need to fret the technical complexities about information sharing in social media when communicating with their online stakeholders. The tool works for investor relations, brokers, funds and employees. It simply helps them engage in social media, while ensuring that they are in compliance with the law. Each cmp.ly link within a social media post has a unique code. This helps the system track syndication and measure online word of mouth as content gets picked up and quoted elsewhere. The traceable nature of content also means that content that gets syndicated remains in compliance. Companies do not need to worry about liability issues as users share and re-tweet or re-post content. You can watch a video announcement about this smart solution here. Can Your Phone Be Your Wallet? According to trends revealed in the March/April 2011 issue of MIT's Technology review, in the US, we haven't given up on our checks but we are increasingly accessing our card information on mobile devices. Meanwhile, a global review of mobile payments show that emerging markets are ahead of developed markets when it comes to this emerging form of money exchange. The analysis does not indicate whether these payments are coming from simple or smart phones, but they do underscore a certain level of comfort with mobile payments. These numbers also suggest that Google's latest partnership with Citibank to offer a mobile wallet app to Citibank Mastercard and Nexus 4S phone customers is on the right track. When the Google wallet app launches, it will let users simply tap their phones on paypass signs and make payments directly from their accounts. They will also have opportunities to redeem coupons and benefit from special offers. Few merchants, including Sports Authority, Container Store, Duane Reade, Walgreens and Macy's have signed up for the deal. Google is assuring potential early adopters their transactions will be secure. This is indeed exciting news for those of us with messy bags and multiple gadgets, looking to consolidate everything on a smart phone. But the real opportunity seems to be for those emerging market economies with populations eager to adopt new technologies and need easier ways to access money and make transactions. The next trend to watch is the boost these types of technologies can bring to local economies and help connect publics with merchants in more efficient ways.